I like the basic black, finally time to go back to that original blow dryer look. I think a lot of time companies try to make their products all about the packaging and not about the product. Good marketing scheme, but in the long run it will be doomed because people buy expensive makeup and beauty products why? Because they work! So I like that Karmin didn't have to dress up their dryer to prove it's worthy. So what's the verdict? I love this dryer. It completely eliminates the frizz and it helps with shine and breakage. After trying the blow dryer a total of 3 times, I mostly noticed the frizz aspect. It worked wonderful with my favorite hair product of all time, which is Redkin Argan Oil and with a little blow drying serum this dryer was not only somewhat quiet but works well and has different levels of heat and speed. For people that don't think the type of dryer you use matters, it totally does! When it comes to drying and curling irons, quality DOES matter because you don't want to destroy your hair, especially when you're using a tool everyday. That's why I've always stressed to my readers, a good hair product is a must. Everyone wants to have good hair, so why not splurge a little bit and get a product that will not only last but will do the job and do it well. The Karmin G3 Dryer does the job to perfection. I also want to stress that the Karmin Dryer works well with any hair type. I have wavy thick hair, but it will also work great on thinning hair and curly hair, (my friends used it once as well too!) We all thought it was awesome. Trying it before Halloween trick or treating with the kids, my friend who has THIN hair, and my friend with curly hair both blow dried with the Karmin. No complaints at all. 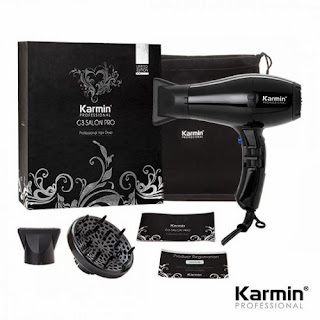 Right now you can purchase the Karmin Professsional G3 Salon Hair Dryer here for $159.95 which is 16% off the regular price. Also find them on Facebook to find out more about the product and it's good to know about frequent sales or coupon codes. Disclosure: A press sample was sent to me for review for the purpose of this review only. All opinions are my own. No monetary compensation was received.